Paperback: 128 pages Publisher: Motorbooks (February 29, 2004) Language: English ISBN-10: 0760311773 ISBN-13: 978-0760311776 Product Dimensions: 10.4 x 8.2 x 0.4 inches Learn the full story of the best Corvette yet created in this history of Chevrolet's groundbreaking C5. 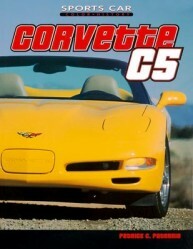 Introduced in 1997, the C5 set new benchmarks for performance and provided an American player on the world's sports car scene.In this book, veteran automotive writer Patrick C. Paternie covers the car's stormy development period, successful launch, it's development over its years of production (including the awesome Z06 model), its racing accomplishments, and a special chapter devoted to the greatest C5-based tuner cars from around the world. Pros: Valuable C5 history book. At this writing, in late 2004, there are a number of books about the 1997-2004 "C5" Corvettes out there. One of the best and also my favorite is All Corvettes are Red by the late, Jim Schefter. It's a great history of the design and development of the C5, however, "ACR" is a traditional, hardcover title with only a few photos. Patrick Paternie's C5 Corvette is a nice companion for Schefter's book in that it's a sort of executive summary of what's in ACR but with a little more technical depth, especially on the C5's engines and, most importantly, it has a lot of photos, mainly from GM's Media Archive and noted automotive photographer, David Newhardt. On my Corvette bookshelf, these two are kept next to each other. One thing C5 Corvette has that All Corvettes are Red does not is a chapter on the C5-R race program. Additionally, where Schefter's book ends with the 1997 model year, Paternie's book covers all the way until the platform ended production at the end of the 2004 model year. These qualities of the book were more reasons why I've added C5 Corvette to my collection. The book's only weakness is the author's misunderstanding of some aspects of the C5's suspension. The technical discussion of that contains several errors, particularly in areas where the Author tries to cover a key, C5 chassis design feature: the decoupling of ride-and-handling through specific suspension bushing placement and design. As a whole, C5 Corvette reads easy, is an interesting story of the '97-'04-car's design, development and production, is delightful to look at and is a worthwhile addition to any late model Corvette enthusiast's reference collection.